← Flash Sale on KosherLamps! If school just ended for the year, and you’re already dealing with the cries of “mommy! I’m bored!” don’t worry. We’re here to help. During the summer months while your children are not learning in school every day. 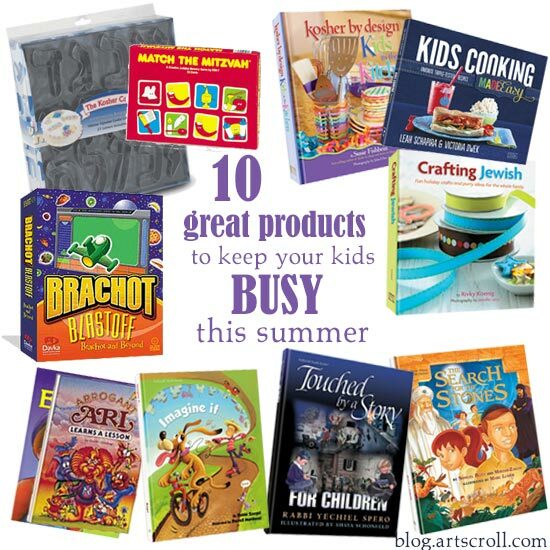 keep them busy and keep them learning at the same time with ArtScroll’s fabulous children’s books and our full line of products for kids of every age. Here’s a sampling of our favorite options! 1) Kids Cooking Made Easy: filled with delicious and kid-friendly recipes, fun craft ideas, and as many cooking tips as your kids might need, this hot new cookbook will keep your kids in the kitchen and out of your hair! 2) Kosher by Design Kids in the Kitchen: This classic best-selling cookbook from celebrity kosher chef Susie Fishbein is chock full of fun recipes that your kids will love to cook – and eat.! After all, we all know that bored kids quickly turn into hungry kids! 3) Imagine If…: This latest children’s book from ArtScroll has been getting rave reviews – from the children “This book is so funny! I love it!” to the parents, “I think I enjoyed reading it even more than my kids!” everyone is loving the fun rhymes and adorable illustrations. 4) Crafting Jewish: What better way to keep your children from kvetching about how bored they are than a book full of craft ideas and inspiration, specifically for the Jewish calendar? Watch out though – you might find yourself joining in! 5) Match the Mitzvah Memory Game: Combine a classic favorite matching game with Jewish themes and lessons, and you’ve got the perfect game to keep your kids busy this summer. Bonus – it’s small and easy to pack, so bring it on your family vacation and pull it out when you need a few quiet moments. 6) Search For the Stones: Award-winning children’s book author Shmuel Blitz recommends this story for an exciting and enjoyable read – for the kids or the grownups! Over 20 other books by Shmuel Blitz will ensure that your kids have plenty of entertaining and educational reading material this summer. 7) Alef Bais Cookie Cutter Set: Turn your cookie baking adventures into a learning experience by having your kids form words out of cookies. Then they can literally “eat their words!” This set is great to have around for birthdays, upsherins, bar mitzvahs and other simchahs as well! 8) Brachot Blastoff Computer Game: If your kids are going to take some downtime at the computer after a day in the sun, make sure they learn something while they are there. This game teaches children about the proper brachos for foods. We have some other great Jewish software on our site as well, so make sure to browse the whole selection. 9) Touched by a Story for Children: Love the touching stories of Rabbi Yechiel Spero? Your kids will enjoy them too, with this Touched by a Story for Children series. Written especially for them, and featuring wonderful illustrations, this is a book that will captivate and entertain – all while teaching important lessons. 10) Middos Series These classics will give you a taste of nostalgia as you read your kids the same books you grew up on! With best-selling favorites such as Eli and His Little White Lie or Arrogant Ari Learns a Lesson, you can teach your kids good middos and keep them entertained, all at the same time! Click here to browse all children’s books from ArtScroll.